Matter of Trust is the fiscal sponsor for this bioremediation research program. Microbes, worms, compostable waste are available all over the world and wherever oil spills occur. In the final stage of this experiment, we were able to prove that thermophilic composting followed by vermiculture can remediate oil spill waste. When the oil from the spill is collected with booms and absorbents, the standard method of disposal is incineration or in landfills. In an effort to avoid the environmental degradation associated with these options, Thomas Azwell from Norman Terry’s UC Berkeley Lab, (where an indoor control was also conducted) designed a process of bioremediation to safely process oil. Because hair mats are an organically based material, we were able to use a combination of natural technologies for remediation. We first experimented with using mushrooms (Phase 1), then thermophilic composting (Phase 2), and in Phase 3, we added worms to the mix. After processing with microbial inoculants and thermophilic composting the hair mats were now environmentally safe. They were then ingested and processed by worms resulting in a rich worm casting fertilizer. These experiments carried over a two-year period successfully demonstrated a practical hands-on study to further the cause of an effective closed-loop system for oil spill clean up. The worms provide aerating tunnels through the piles. 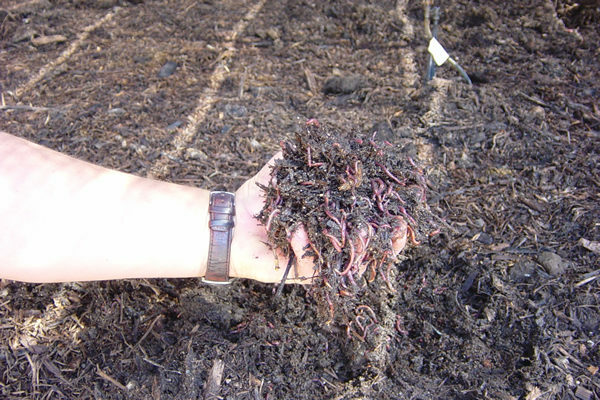 And the worm castings provide a rich commercial product that can be sold for freeway landscaping. The process does take time, labor, and a large amount of space. It is a viable, responsible, low cost, low-tech solution that is empowering and ultimately better for the climate than incineration or landfilling.